Very nice park located above the Sandy River. Office staff was courteous and helpful. DO NOT TAKE EXIT !8...your GPS will take you there but 17 is much much easier., so exit 17 and let your GPS reroute itself. Sites were level with very good shore power, good WiFi and room to park vehicle. We had a river front site which was super nice, had a bit m0re privacy than other sites in the middle, we had nice lawn area plus the beautiful river to see! Lots of crazy squirrels running around picking up walnuts from the trees and grounds, they were busy! Yes there are planes and trains but they weren’t horrible....yes you hear them when you are outside once or twice a day, but we were closest to the tracks and didn’t hear them at night when we were inside so no problems. HINT: if you want to go into Portland, take the MAX blue train, for 5.00 you can get an all day pass and go all over the city! Easy access to shopping and restaurants. We would definitely stay again. small sites but easy to get in and out of. Friendly staff. Nice location to all local attractions..Would certainly stay here again. If you stay here, make sure you go to Tad's for chicken and dumplin's, its well worth it. This place has seen it's day. The facilities are adequate but outdated. The cement pads are broken and crumbling. Many full timers with old rigs and junk and old furniture around them with home made staircases. Priced too high for this place. Nice location by the river. Too bad they're letting this place go downhill. The streets are extremely narrow as are the sites making it very difficult for larger rigs to maneuver. The site was level and the park was clean. The main problem is the trains which run all night long. There are constant train whistles during the night as the tracks are very close by. We did not use the restrooms so cannot comment on that. The WiFi was OK. Very nice park located above the Sandy River. Office staff was courteous and helpful. Sites were level with very good shore power, good WiFi and room to park vehicle. Easy access to shopping and restaurants. We would definitely stay again. Sandy Riverfront RV Resort office staff were courteous and helpful. The park has good paved roads, but they roads are slightly narrow so be cautious if you are driving a big rig coach with tow vehicle. The sites were level with very good shore power, good WiFi signal, but cable TV outlet on our site was disconnected. The bath/showerhouse is dated, but adequate and clean. I would stay at this park again. Stayed one evening with a 30' travel trailer to explore Portland. 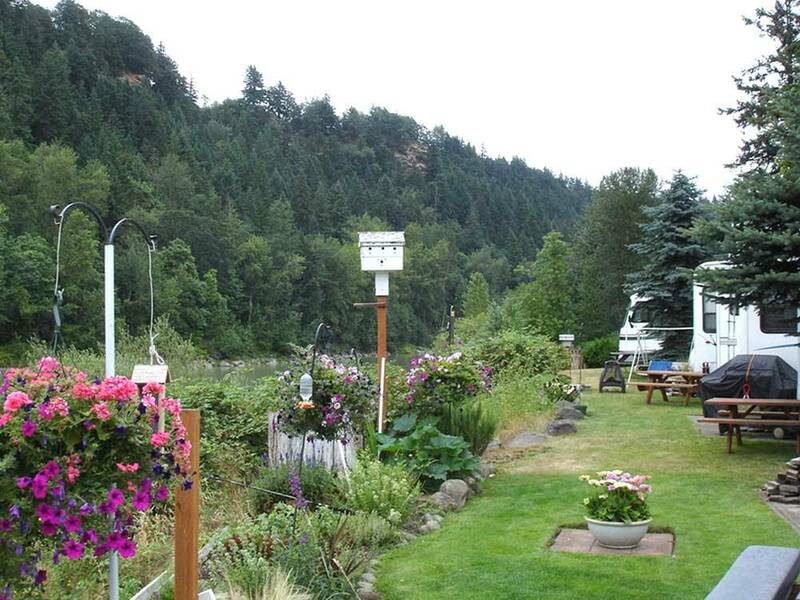 Easy access to the site, beautifully located by the Sandy River (explore the park across from the Resort!). Amenities were decent. Unfortunately, the wifi connection didn't work during our stay (my girlfriend was not happy about that! ).